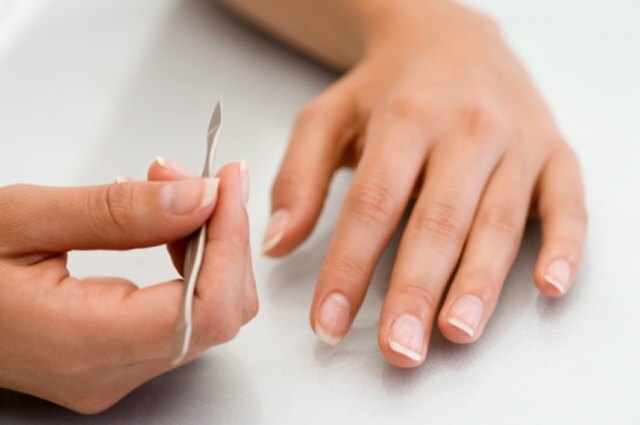 Cuticles and nails can become damaged by dry air, washing dishes, harsh chemicals and poor diet. Even biting and picking nails and cuticles with teeth can cause damage. Weak and brittle cuticles and nails can also be the result of illnesses and medications that drain the body of certain nutrients. Repairing cuticles and nails can be done using natural moisturizers, healing balms and cuticle creams. Vitamin E oil is one of the most effective natural oils. Vitamin E is a natural moisturizer that helps heal cuticles by relieving their dryness. To use vitamin E oil take a cotton swab and dip it into the oil and gently rub it into the cuticles until they are moisturized. Do this twice a day for two weeks until cuticles are healed. You can massage the vitamin E oil into your cuticles using your fingertips before bedtime if you prefer -- and then place cotton gloves over your hands to promote faster healing. Vitamin E oil is a powerful antioxidant that helps rebuild and strengthen nails. You can massage vitamin E oil directly into your fingernails and toenails daily -- using your fingers -- to help hydrate and nourish them and prevent further nail damage. Vitamin E supplement can be taken each day to help nourish cuticles and nails from the inside out. The supplements attack free radical cells that cause cuticles and nails to become dry and brittle due to aging. Vitamin E oil supplements will also help grow the nails out by stimulating growth naturally. However, it is best to talk to your doctor before taking this supplement to make sure it is safe for you -- since it can interact with medications and increase chances of heart attacks. Other natural oils with vitamin E that can be used to heal dried cracked cuticles and nails are jojoba oil, almond oil, sunflower oil, olive oil and coconut oil. You can massage any one of these oils into the nails and cuticles daily or before bedtime the same way you would the vitamin E oil. Soleil Robins began writing professionally in 2010. Her work mainly appears on eHow, and she specializes in writing creative articles about beauty and food.